Mary Robinson writes for The Hill on the occasion of the Sustainable Energy Forum in April 2017. This article was first published by The Hill on 09 April. So, until we prioritize our most vulnerable communities — those at the sometimes metaphorical and sometimes literal “last mile” not yet touched by the electricity grid — we cannot expect to have global modern medical services, improved standards of education, or sustained job growth for our growing population. Moreover, if we’re to achieve all 17 of the U.N.’s Sustainable Development Goals (SDGs) — those essential and tightly interconnected social, environmental and economic goals grounded in human rights and agreed by countries in 2015 — we simply have to achieve Goal 7, and ensure access to affordable, reliable, sustainable and modern energy for all to power the other global goals. Why? Because development requires energy and sustainable development requires renewable energy. Ultimately, without access to energy, people who are poor, isolated, and vulnerable will have few opportunities to improve their lives. Without reliable access to electricity, doctors cannot provide clinical services after sunset. Patients cannot benefit from x-rays, ultrasounds, or incubators. Vaccines and medicines cannot be stored, and doctors cannot communicate with other healthcare professionals. Of course, education also suffers. Students cannot study after dark and because of time spent collecting drinking water and gathering fuel, there is less time for schooling or for productive work or employment. When world leaders adopted the SDGs and, a short time later, the Paris Climate Agreement, they agreed to usher in the energy transition from fossil fuels to clean and renewable solutions. In fact, a rapid transition to renewable energy is essential if the goals set in Paris to keep global temperature rise to well below 2oC above pre-industrial levels and to pursue 1.5oC are to be met. This transition to renewable energy offers a real opportunity to those people who have not yet reaped the benefits of access to electricity. Technological innovation is making renewable energy both more affordable and more accessible for people at all income levels. We no longer need to wait for the grid to reach the last mile. Distributed renewable energy systems such as geothermal systems, micro-hydroelectric systems, solar panels and wind turbines can generate renewable energy close to where it is needed, including in isolated and hard to reach communities. New business models, new financing, new technology, and a new global campaign will help us to put those currently at the last mile, first. The need to reach those furthest behind first and to ensure that no one is left behind in the transition to renewable energy is critical for climate justice. We cannot assume that a one size fits all approach to providing renewable energy services will reach everyone. We have to actively seek out the people and households for whom the costs of energy are a barrier and support them to access the development opportunities sustainable energy creates. If we don’t do this, these households will be overlooked and the predictions of the International Energy Agency that more than half a billion people will still be without access to electricity in sub-Saharan Africa in 2040 would come true. That would only serve to widen inequality and make escaping poverty an impossibility. Access to sustainable energy provides opportunities for greater equality and the eradication of poverty while in the long term more carbon will mean more poverty. 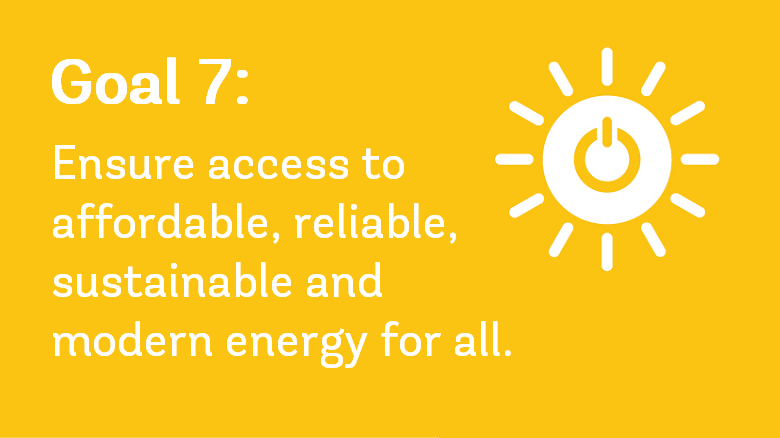 Launched at the Sustainable Energy for All Forum this month, the new campaign, Shine: Investing in Energy Access for All, helps to support investment to make access to renewable energy something every person on the planet can expect and enjoy. Dedicated to finding distributed clean energy solutions that respect human rights and to powering inclusive and sustainable development, the campaign is already uniting partners from the faith, development, and philanthropic sectors who are committing to invest and scale up funding for energy access. By diversifying and increasing funding to targeted access solutions, we can direct funds to support local communities in rural areas to access renewable technologies, and help solve a global problem at the local level. By working together, we can unlock new sources of financing and connect communities, local government and entrepreneurs to investors. In the face of our new geopolitical realities, there is much hope. We can still improve people’s lives and protect the planet. We can strengthen our advocacy efforts to better educate decision makers and investors on climate justice and the benefits of ending energy poverty.